Let your imagination run wild with this San Francisco Pop Out and Play Set. Home to the Golden Gate National Parks, San Francisco is considered one of the most beautiful cities in the world. Filled with pleasing parks and lovely landmarks, this exciting place has plenty to explore—from cable cars to bicyclists, or even the Golden Gate Bridge, you never know what you might spot in the city! 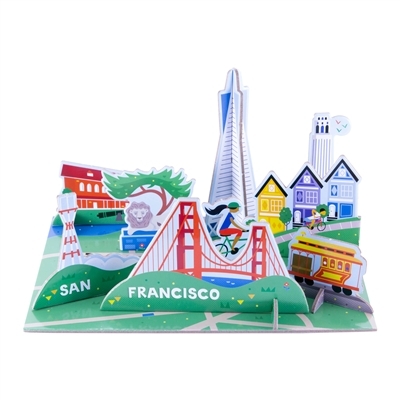 With this charming pop-out play set, you can create and enjoy your very own San Francisco. Each play set contains three pop-out sheets, made from sturdy paper board printed with vegetable-based ink. Perforated cut-outs and simple notches allow for easy assembly.